“four books of tunes in manuscript(1, 2, 4, 5) a goatskin folder of mainly 18th century Dublin-printed music with tunes in manuscript on the backs of many of the sheets (3), a fifth tune-book written probably by his son Conn (6), and some associated items including a range of printed works of literature from the family library”. The approximately 24 printed books which accompanied the manuscripts include engraved music as well as Latin and Greek lexicons, latin and French texts, and an Irish-English dictionary. Eoghan Ó Néill describes this ms (p.283-4), and a facsimile of ‘Lochaber’ on p.60-61 is printed in Kathleen Loughnane’s Connellan book. 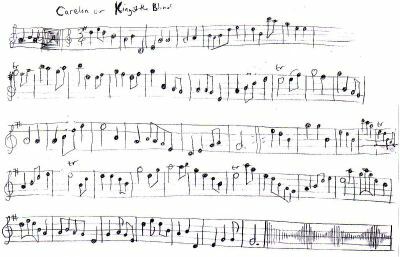 p. 9 Carelin or King of the Blind This tune also appears in Neal without attribution. p.44 C Concerto This is the usual modern set, not the harpers’ collected by Edward Bunting also in the 1790s. ?p.66 Earl of Wigton’s Lament This is the last page of the book and the page number is illegible in the photographic copy I saw. The tune is the same as in Dow and breaks off at the bottom of the page, after the 5th bar of the 2nd variation. MS44.806/4 is an upright format music book in a 19th century hand, containing a selection of Irish and other tunes. The last page is dated 16 June 1807. MS44.806/5 is an oblong format book in an 18th cebtury hand that may be Pádraig Ó Néill's. It contains Irish and other tunes and song airs. MS44.806/6 is a small oblong format book in a 19th century hand. The paper is written on one side only so alternate openings are blank and written. The book contains on p.19 the name “Cornelins O Neill of ONing”, and the music in it is mostly Irish song airs. Conn was Padraig's son. MS44.806/7 consists of 8 upright format loose leaves in a 19th century hand. Some of the tunes are dated in the second half of the 19th century, e.g. on p.5 ‘January 17th, 1860’ and ‘September 10th 1861’. The music includes tunes from Moore’s Irish Melodies. MS44.806/8 is an oblong format printed book, missing its title page but titled on p.116 ‘flute companion vol:2’. Some similar loose pages are slipped into the back of one of the other mss (either 5 or 1, I don't recall). The books by Pádraig Ó Néill are very elegantly written in a charming naive style, with elaborate copperplate or bold serif titles, and decorative flourishes or borders to some verse pages. His son Conn's book and the other 19th century manuscripts are plainer. Thanks to Nicholas Carolan and the Irish Traditional Music Archive for showing me the photographic facsimile, and to Seán Donnelly for assistance in Dublin. The new book by Kathleen Loughnane, 'The Harpers Connellan', includes facsimiles of two tunes from these manuscripts.